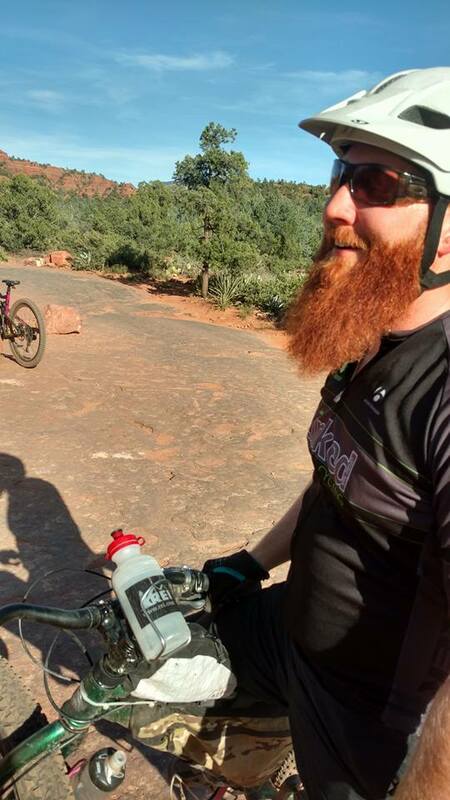 Heath over at DirtBags Bikepacking has been busy. 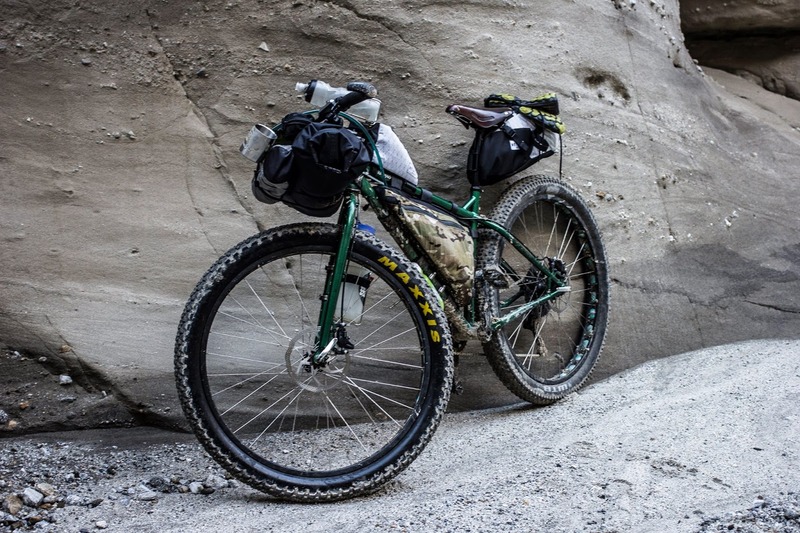 Last year he made a custom set of bags for my Salsa Colossal. The three bags came as part of a “Intro to Bikepacking Package”.For only $215, this is one sweet deal that you should definitely check out! We received the original version of the Intro to Bikepacking Kit, which cost $280. 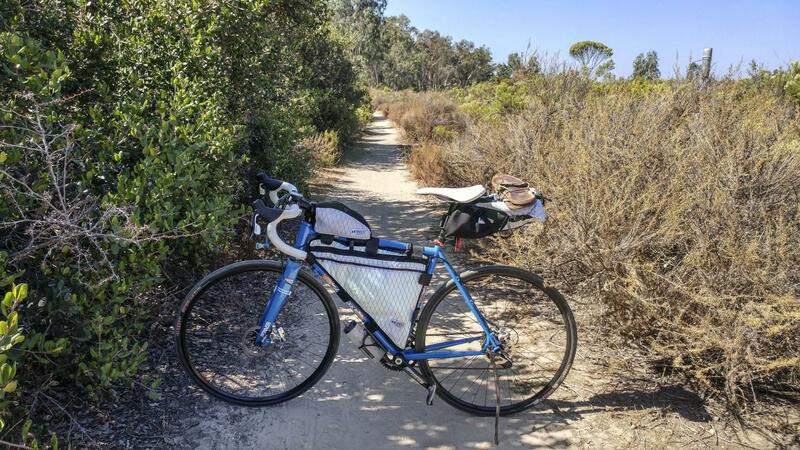 It included “The Wanderer”, a custom full-triangle frame bag, “The Minimalist”, a small seat bag, and “The Burrito Hauler”, a top tube accessory bag. 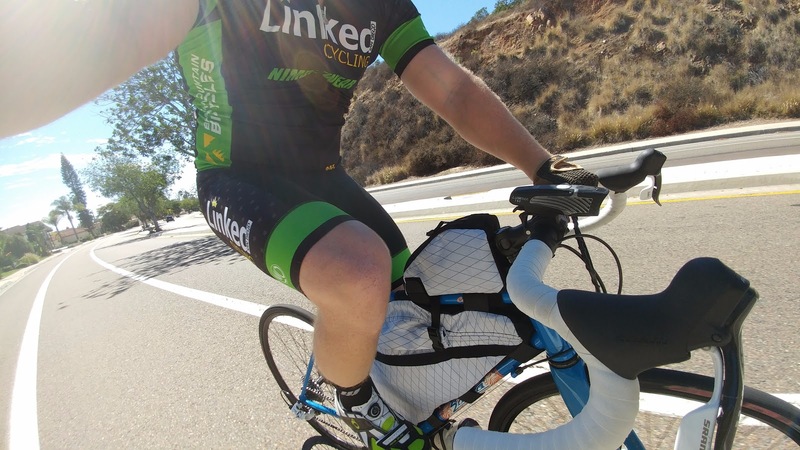 The new starter pack for $215 still includes a Minimalist seat bag and Burrito Hauler bag, but now features a universal half-triangle frame bag, called “The Seeker”, instead of the Wanderer full-triangle frame bag. Throughout the last year, I’ve used them on bikepacking trips, commuting, and as my go-to gear bag for weekly mountain bike rides. I went over the fine details of the bags in my original first look review, and now feel I’ve logged enough miles with them to report back on their long-term quality. I say Heath has been busy, because the construction of his bags has evolved significantly since he sent me this set last year. Go take a look at the DirtBags Instagram page for a peek at their highly creative and well made patterns. I can tell they’ve addressed issues from past models, and their bags look tougher and better than ever. Construction, fit, and customization. I’ve put a lot of miles on some of these bags, and they’re holding up great. Zippers, straps, and nylon are all doing just fine. I love that you can customize color and closure system, even when ordering one of their intro packages. Plenty of thought went into these bags, and it shows. I also love that you’re ordering from a small business and supporting someone’s family directly. These aren’t mass-produced bags, they’re made with care and an eye for creativity. There are a few things that I would suggest improving on future bags, or at least things to be aware of if you’re considering ordering a set for yourself. 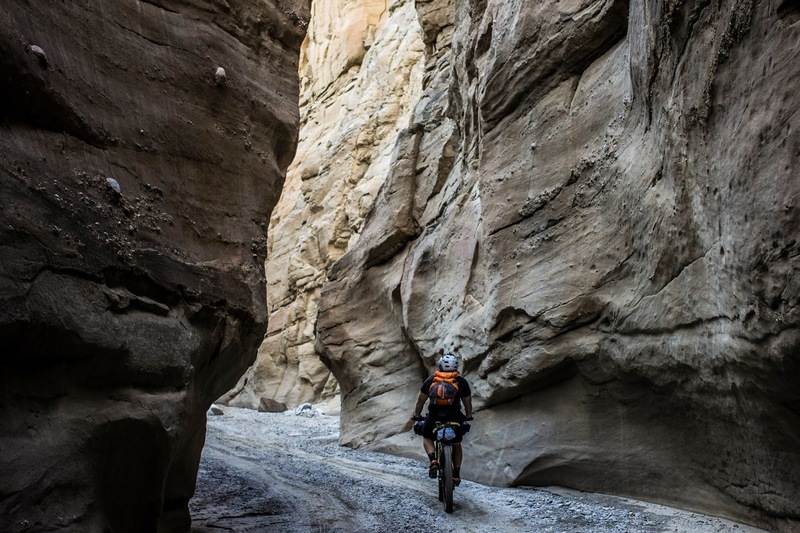 The Minimalist seat bag is, as its name implies, quite small when compared to other larger capacity options like the Revelate Viscacha. It’s got plenty of room for a good amount of gear, especially when your pack list follows the light and fast minimalist style. 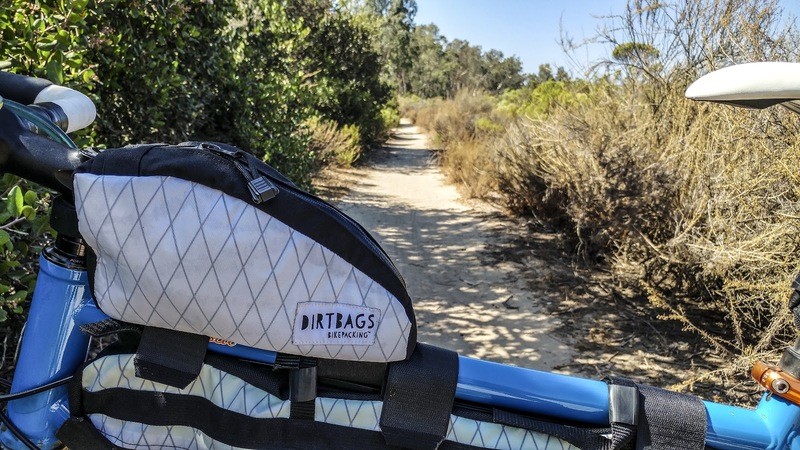 Dirtbags describes it as “Easily stores a small sleeping bag, extra clothes, or food”. I had to test its limits however, and when doing so, I had a hard time fitting bulkier items like a cookset in it. My greatest desire for improving this bag didn’t have to do with the capacity however. I really wish Dirtbags would have used locking strap cams or buckles. The bag stayed plenty secure on long paved rides, but would slowly droop over miles of off-road touring. On one overnight trip, I rode off a small drop and actually sucked the whole bag into my rear wheel, subsequently crushing my main camp pot. Every bag I’ve seen without hardware for locking the straps in place has had this same problem. It is time to make them standard issue. The Wanderer triangle frame bag was voluminous, which I loved, but as I mentioned in my first review it would have benefited from a larger roll-top opening. It was just hard to get bigger items situated in there properly. If roll-tops aren’t you’re thing, the bag is also available as a zippered option. It also could have benefited from a slight taper near the cranks. It cuts down on a little volume, but it’s nice not to worry about constant crank-rub on the side of your bag. 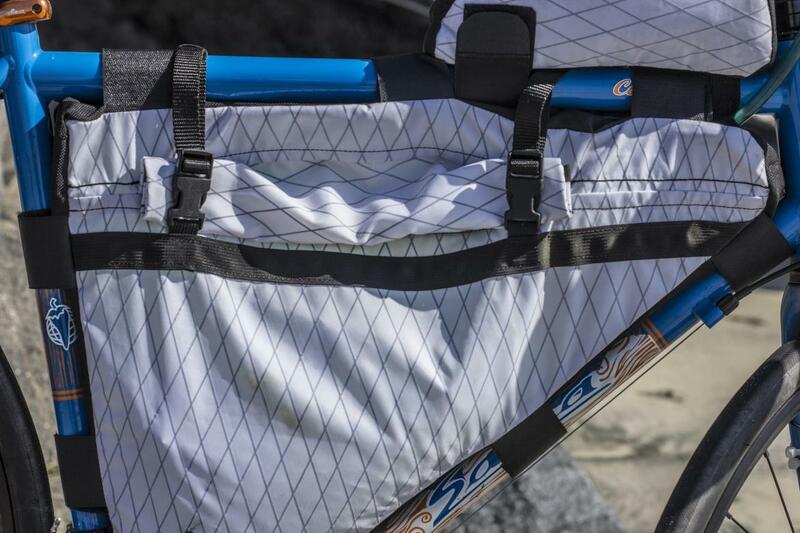 Of all three bags, the Burrito Hauler top tube accessory bag has logged the most miles with me, and has been a constant addition to my mountain bikes for tools and snacks. It’s a great little bag and has held up nicely. The newer version of the bag has more rigid sides to help it sit upright, which looks great as mine tends to droop to one side. All the bikes that I’ve used this on have small-diameter steel tubing, which contributes to it’s gentle lean. The one time I attached this bag to large hydroformed aluminum tubing, it sat perfectly upright. The main strap that secures this bag to the top tube was cut much too long for my small tubes, leaving several inches of unsecured hook and loop dangling. Rubbing against the abrasive Velcro has ripped the stitching out of several pairs of my cycling shorts, as they come in contact when I stand to climb. Again, this is probably only an issue because of my small diameter tubing, and I will probably just cut down the length of the strap to fit better. 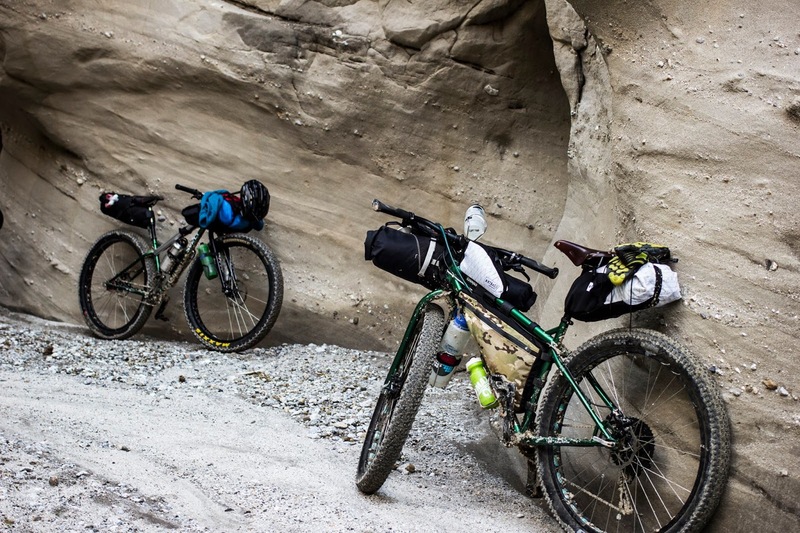 Disclaimer: DirtBags Bikepacking provided these bags to test, free of charge. We were not paid or compensated in any other way for this review, and strive to be as open and free of bias as possible.